I’m very glad I made a list of the things I used for the Blogging A to Z Challenge last year. If not, I’m sure I would be repeating myself! That almost happened today! I was trying to find things to use for the letter X. I even downloaded the Dictionary.com app to my new smarter than me phone so that I could search while Ralph and I were on a short road trip. It’s a great app and I’m sure I’ll use it but it didn’t help me. No fault of the app. Last year I did X marks the spot because I couldn’t think of anything else! As I looked back at last year’s post, I realized that most of my photos disappeared. Not happy about that, but this is a new year! I won’t let that happen this time because I’m also part of Snapshot Saturday today, and photos disappearing just wouldn’t do! Snapshot Saturday is hosted by Alyce at At Home With Books so please be sure to check out some of the other great photos posted there. This year I’m making a different use of the X. The X is used to cross things out, to remove something added my mistake, something not necessary. That’s what I’m doing right now. I’m making great use of the letter X in my life. I’m crossing out the unnecessary things, objects I no longer need…literally cleaning house. Trying to clear out some emotions I don’t need at the same time. I think I’m getting there bit by bit. Thursday was a good day and helped in that regard. I’ll talk more about that when the Challenge is over. So I want you all to think of me this weekend and in the coming weeks putting a great big old X across a lot of things. So much needs to be accomplished and I’m starting to have confidence to believe that it will. Now to my snapshot for the day. I was just talking about clearing things out. Well, this is an odd segue but how about a beautiful clear blue sky and some trees. This was taken at the Revolutionary War battlefield park that is in our town. I love taking photos there. I don’t know why I like this one so much. I just do. X some of those negative things out of your life and allow yourself to see the clear blue sky! 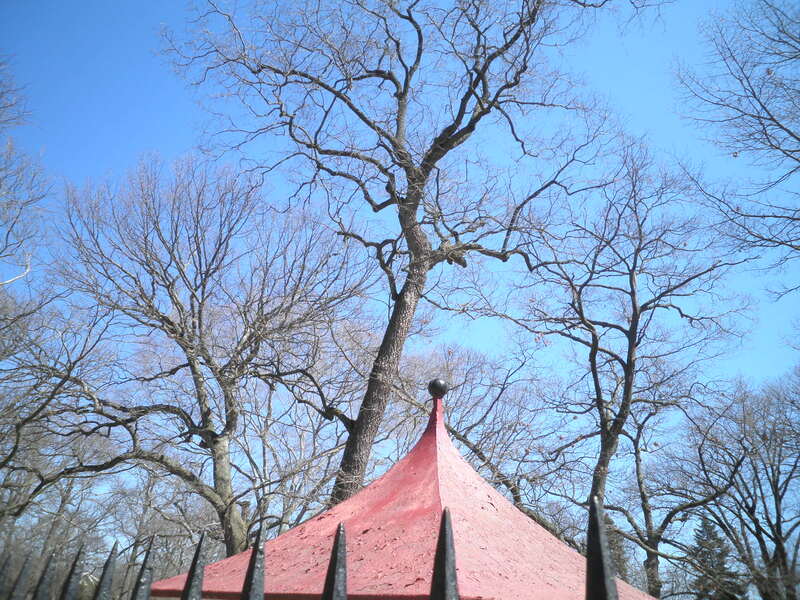 that IS a great photo, fran – for me, i love the contrast between the red roof and the blue sky. i like the reaching tree branches, too. you are so right – once we make the decision to X out the negativity, be that people, habits, whatever, we become more optimistic. sounds like you are working through some stuff and i am thinking of you!!! Thanks, Cathy! Can’t tell you how much I appreciate it! Enjoy your weekend! Love the segue to that gorgeous photo…and it is definitely something to help clear out the negativity. Thanks for sharing. Thanks, Laurel! I keep at it! Enjoy your weekend! Good on you for decluttering. I think your photo is striking too. Thanks, Louise…I’m giving it my all! Glad you like my photo. Enjoy your weekend! I think this is a great capture. I like the look of the spikes from the fence. Thanks, Diane! Glad you like them! Nice picture and good look to you X’ing out the negative things..it’s good for the soul! Glad you like my photo, and telling myself I’m x-ing the negative is making me feel better already! I love that lacing of branches–beautiful! Thanks, Cheryl…glad you like it! Enjoy your weekend! The sky is a gorgeous blue! Blue sky, A red top that features prominently. And a row of teeth to keep the “bad guys” out. You’re too funny. Actually it’s a fence around a Revolutionary Warm monument! Have a great weekend, Rob! Love your take on this challenge…very clever. I too am crossing out the unnecessary things and it feels amazing. So so happy to have embarked on this, glad you feel the same way. Have a great Saturday Fran! Ameena, I’m glad to know I’m not in this alone! We can bolster each other. Have a great weekend! X is that devilishly difficult letter when it comes to alphabet challenges! 🙂 I like your take on it and your photo. Thanks, Alyce! It wasn’t easy…the X not the photo! I just happened to be in the park on that beautiful day and it just happened. Have a great week! Gorgeous picture — I love every part about it, the blue sky, the tree branches, the rooftop. So cool! Here is my SATURDAY SNAPSHOT post. Thanks, Melisa. Usually, I just snap away. I really thought about it first. Glad you liked it! I wish I can easily x-out some of the stupid decisions I’ve ever made in my life. 🙂 Lovely snapshots. Thanks for stopping by, Joy. I’m with you on X-ing out some of those decisions. Guess we just have to live with them or maybe live around them. Glad you like my photo. Please visit again! You go Fran! I’m so proud of you for xing or cleaning out the house. I know you can do it, and I’m always here to cheer you on. Meghan, You are the best! I can see you in your cheerleader outfit now! I really appreciate it!